If you've read our latest issue, you'll know we're big fans of this book. Jitesh Patel takes a celebratory look at the humble tote bag and showcases the rise of the tote bag’s popularity from the arm candy of the eco-shopper to the ultimate fashion statement. It features the work of a wide range of illustrators and designers from around the world who have all put their stamp onto canvas, we just love all the bold graphics. It all started (as it so often does) when Patel started his own blog, showing off his huge collection of tote bags. It tells you everything you would ever need to know about the trusty tote. 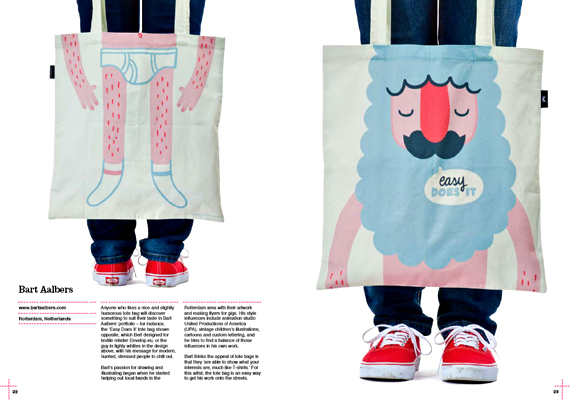 For Example: I love Bart Aalbers designs in the #totebagbook from @LaurenceKingPub and want to win a copy. This is great! I love tote bags!